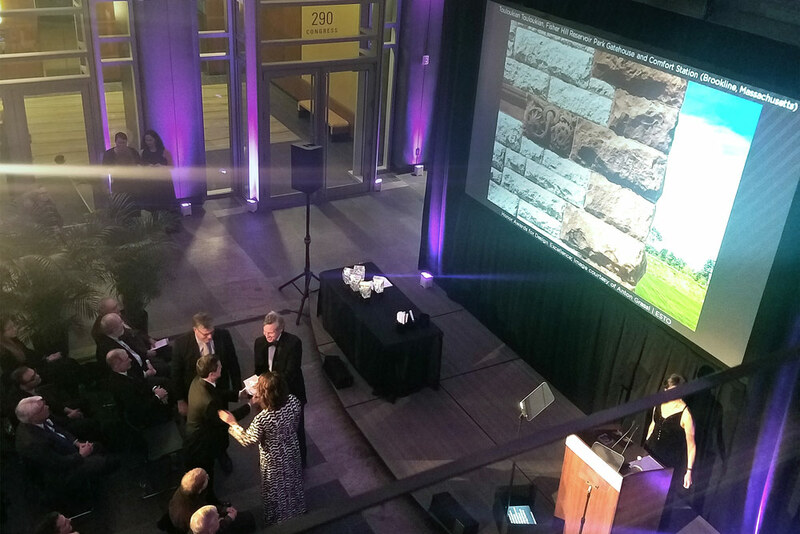 We are excited to announce that the Boston Society of Landscape Architects has honored KMDG with two design awards. Both Fisher Hill Reservoir Park and Suffolk University’s Roemer Plaza have won Merit Awards for Design. The project captured an important opportunity to transform an abandoned piece of public infrastructure into a public park for passive and active recreation. The distinctive landforms and architecture of this former Massachusetts Water Resources Authority (MWRA) facility were retained and integrated into a park serving new functions. Elements such as a wall and topographic marker indicating the high-water mark, allow visitors to experience ‘plunging’ into the former watersheet of the full reservoir. Granite pavers with a carved map of the state-wide water supply system, of which the reservoir was a part, help contextualize this place in the state and neighborhood, and illustrate how our water resources are still delivered. 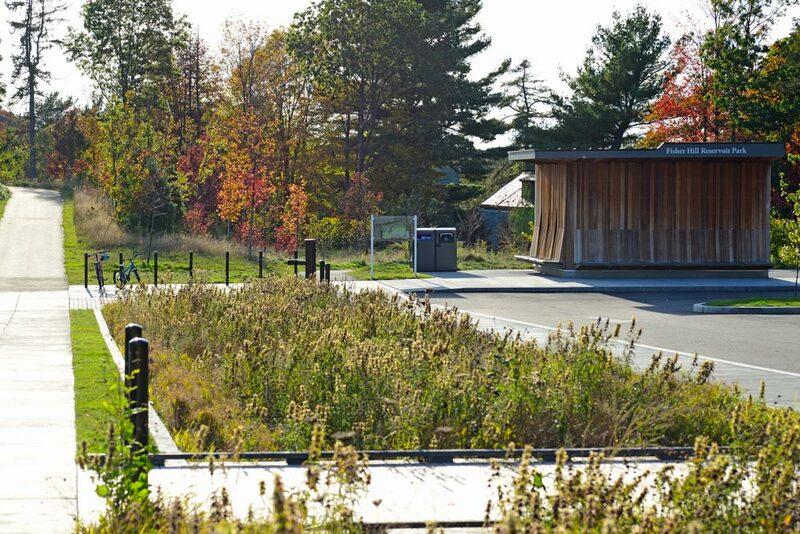 The fully accessible path network allows universal access to the various artful play elements, prospect points, and diverse, native, woodland and meadow plantings that give the park scale, seasonal interest, and ensure a rich botanical future. The redesigned Roemer Plaza transformed an underutilized 1960s era open space into a multi-functional, university plaza, that provides flexible circulation and much needed campus gathering spaces within a tight urban fabric. When Suffolk University purchased Massachusetts’s Metropolitan District Commission’s (MDC) property on Boston’s historic Beacon Hill, their proposed new building presented the design team an opportunity to re-envision the adjacent run-down plaza. Identifying the need for a campus identity and connectivity through this space, the design approach addressed the topographical and structural constraints of the site. With the plaza sited above an existing structure, the design features an amphitheater of stairs and seating that reconnects the existing upper and lower plaza levels to facilitate stronger circulation and provide a seating/stage relationship that allows Suffolk University to hold outdoor campus events. Pockets for plantings were carefully coordinated to work with the existing structural loads. Our commemoration strategy focused on the great places that are a result of the MDC. Eighty MDC place names are raised from a black granite plinth centered in the plaza. 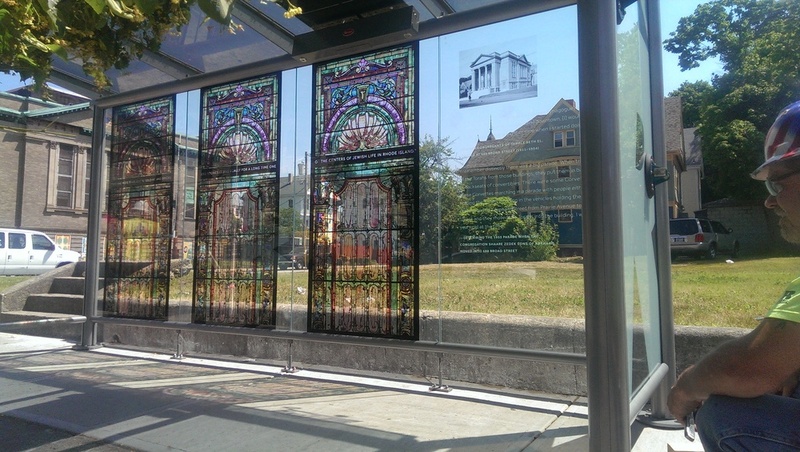 In addition to the plinth, panels standing 12’ tall and 175’ long, exhibit historic maps, plans and photographs highlighting important MDC projects around the greater Boston area. We are excited to hear The Steel Yard was recently named a Champion in Action® for Community Arts by Citizens Bank and Providence's NBC 10. Congratulations to the whole team and the work you do to foster creative and economic opportunities for the greater Providence community! See more about The Steel Yard's Champion in Action® award here. 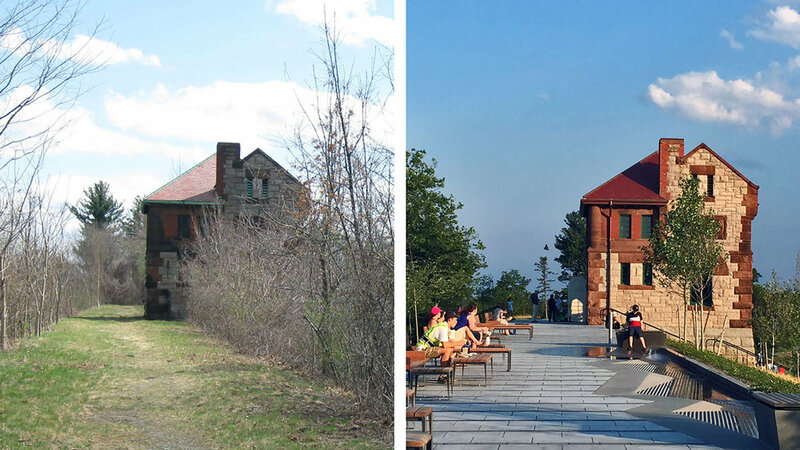 Congratulations to Touloukian Touloukian and team for winning a 2017 BSA Honor Award for Design Excellence for the Fisher Hill Reservoir Gatehouse and Comfort Station. View looking across the reservoir at the historic gatehouse. Both the Reservoir and Gatehouse were added to the National Register of Historic Places in 1990. Looking across a bioretention basin at the Touloukian Touloukian designed comfort station. We are excited to announce two of our projects were among the winners at this year’s American Institute of Architects (AIA) New England Design Awards! 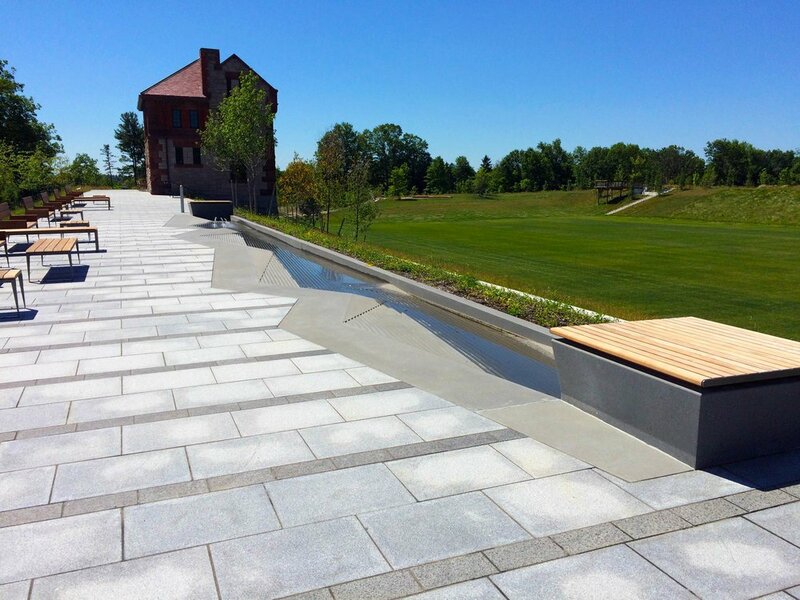 Our recognized projects were Suffolk University’s Roemer Plaza and Fisher Hill Reservoir Park. Roemer Plaza at Suffolk Universty’s Beacon Hill campus was an underutilized, disconnected space situated above a parking garage and divided into two parts by a 14’ grade change. The plaza was transformed to a continuous public open space with a forecourt for nearby state office buildings and an exterior classroom for the university. Fisher Hill Reservoir Park was a KMDG design that preserved the important historic reference points on Fisher Hill by keeping the reservoir’s earth structure and historic gatehouse. 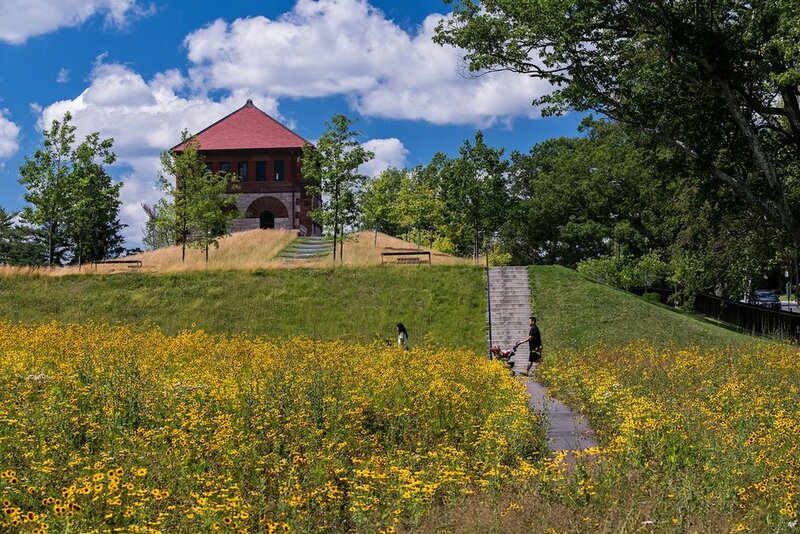 Our partners Touloukian Touloukian won for Historic Preservation + Adaptive Reuse for the work to preserve the gatehouse at Fisher Hill Reservoir Park. Congratulations Ted Touloukian and team! Click Roemer Plaza and Fisher Hill Reservoir Park for more information on our projects. Summer Star Wildlife Sanctuary was awarded Green Building of the Year by the US Green Building Council - Massachusetts. A big congrats to the team! 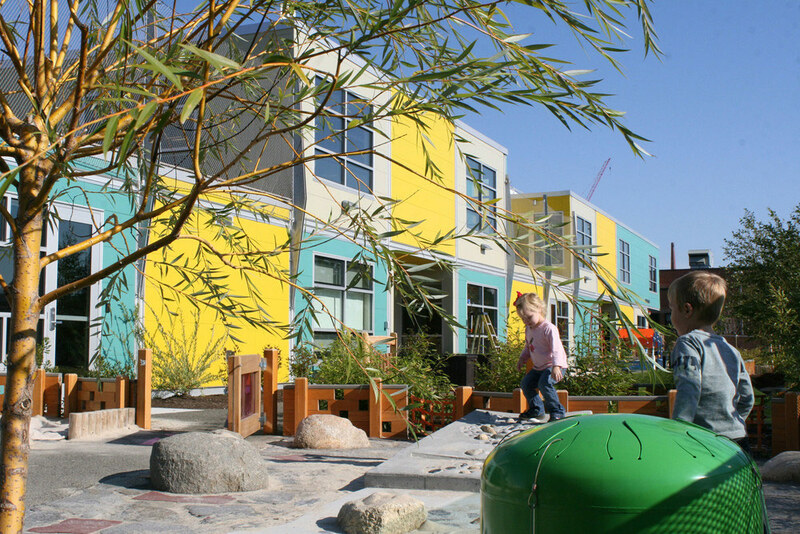 The Bruner Foundation published their 2013 book of case studies for the winners of the Rudy Bruner Award for Urban Excellence, which we were honored to be a part of. Click HERE to read the case study in its entirety. More info on the Steel Yard. Mark had the opportunity to sit on the jury for this year's AIA Maryland Design Awards. More information HERE. Anmahian Winton's Harry Parker Boathouse, one of last year's winners. Kaki participated in this year's Harleston Parker jury for the BSA to honor the best architecture built in the Boston area within the last 10 years. Click HERE for more information.